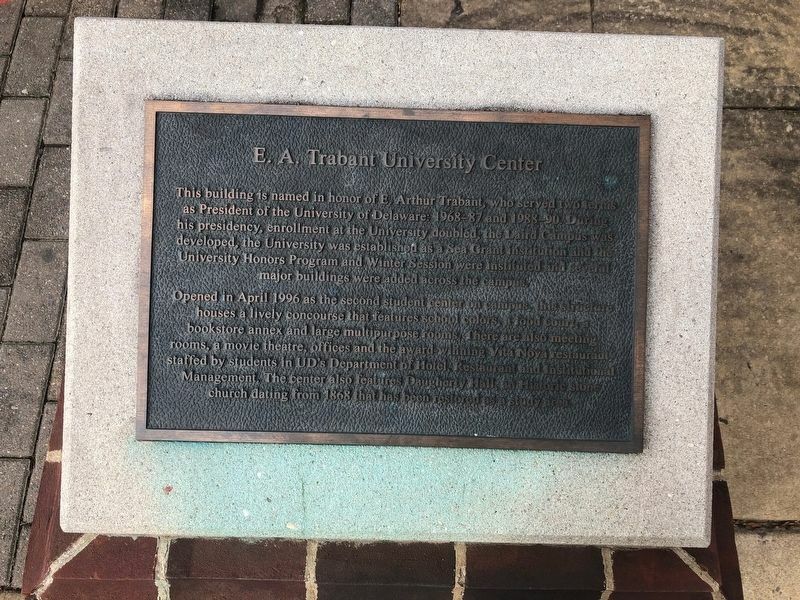 This building is named in honor of E. Arthur Trabant, who served two terms as President of the University of Delaware: 1968-87 and 1988-90. During his presidency, enrollment at the University doubled, the Laird Campus was developed, the University was established as a Sea Grant Institution and the University Honors Program and Winter Session were instituted and several major buildings were added across the campus. Opened in April 1996 as the second student center on campus, this structure houses a lively concourse that features school colors, a food court, bookstore annex and large multipurpose rooms. There are also meeting rooms, a movie theatre, offices and the award-winning Vita Nova restaurant staffed by students in UD's Department of Hotel, Restaurant and Institutional Management. The center also features Daugherty Hall, an Historic stone church dating from 1868 that has been restored as a study area. , in New Castle County. Marker is at the intersection of South College Avenue and West Delaware Avenue (Delaware Route 273), on the left when traveling north on South College Avenue. Touch for map. Marker is at or near this postal address: 92 South College Avenue, Newark DE 19717, United States of America. Touch for directions. Other nearby markers. At least 8 other markers are within walking distance of this marker. Wilbur Owen Sypherd (1877-1955) (about 300 feet away, measured in a direct line); Hugh Rodney Sharp (1880-1968) (about 400 feet away); George Evans House (about 400 feet away); a different marker also named Hugh Rodney Sharp (1880-1968) (about 400 feet away); Harry Fletcher Brown (1867-1944) (about 400 feet away); Raub Hall (about 500 feet away); Robert W. Gore, B.ChE., 1959 (about 500 feet away); The Diamonds Walkway (about 500 feet away). 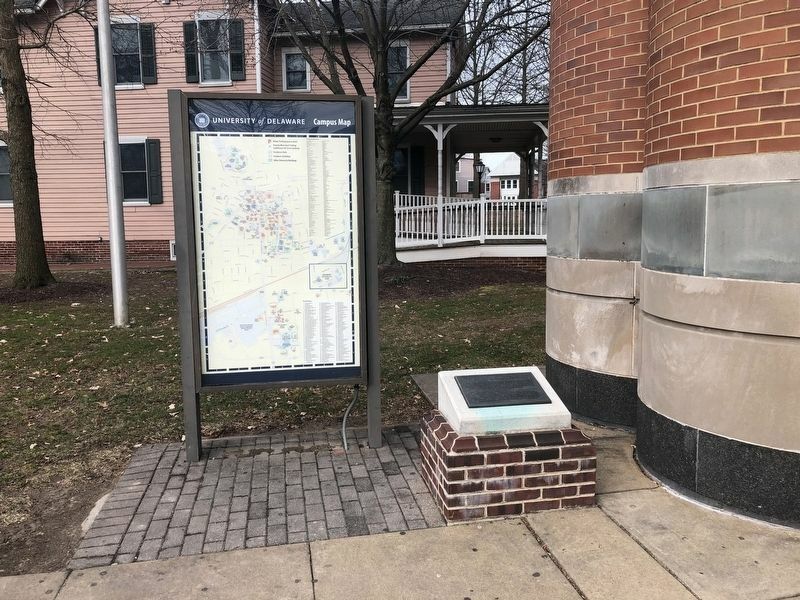 Touch for a list and map of all markers in Newark. More. Search the internet for E. A. Trabant University Center.